When it comes to considering stun gun vs taser buying options, it is important for a consumer to examine all of the features of each weapon. 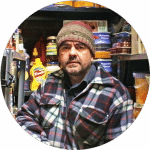 What’s more, when a consumer is thinking about investing in one or more weapons for protection, there are a number of important considerations. Stun guns are easy to use for the purposes of self-protection. Owning a stun gun gives the user a sense of security. Within seconds, the user can gain the upper hand in an attack situation. A stun gun strike leaves an attacker dazed, stunned, and temporarily disabled for several minutes: This gives the victim a chance to get out of the attack situation. A stun gun strike is painful for the targeted individual. When a person uses the device, the weapon transfers energy from the weapon into the individual the user targets with the weapon. The energy delivers a powerful shock to the individual’s muscles and the strike restricts the impulses of the nerves in the body. Following a stun gun strike, the attacker’s muscles become extremely tense, the individual loses all control of balance, falls to the ground suddenly, and temporary paralysis ensues. When paralyzed, the attacker is down because the individual has lost muscular control. 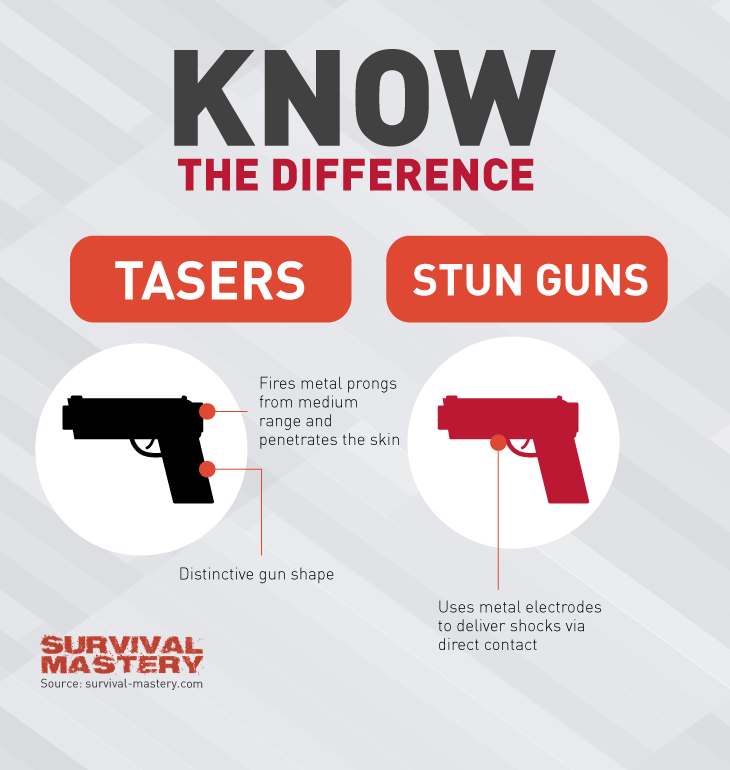 A difference between stun gun and taser weaponry is evident by in the fact a stun gun requires direct contact with the attacker, and a taser can strike from a considerable distance. A common misconception people have about stun guns relates to the fear that the energy of the gun will pass from the attacker to the victim: This idea is incorrect. In fact, even if the attacker is touching the victim at the time of a stun gun strike, the victim is not affected by the energy the stun gun produces. There are different style stun guns. However, such weapons share some similar features. First, at the end of every stun gun, there are prongs. Energy passes through the prongs into the targeted individual. Stun guns are battery-operated devices, and therefore, feature a battery compartment. All stun guns feature a trigger of some kind, although the positioning of the trigger can differ from one unit to the next. A difference between stun gun and taser weapons is identified in how the weapon makes contact with an attacker. The taser shoots out tiny darts connected to conductors that keep the darts connected to the taser device. In contrast, a stun gun does not shoot a projectile of any kind. Rather, the user of a stun gun needs to be able to touch the weapon to an attacker’s body in order to deliver a high voltage shock. Once the weapon makes contact with the attacker’s body, the user can pull the trigger on the device to deliver the powerful shock. When the shock passes through the attacker’s body, it forces the muscles into overdrive; the muscles begin to work incredibly fast. 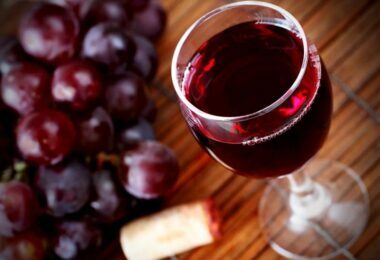 The increased muscular activity leads to a decrease in blood flow and necessary sugars. As mentioned earlier, the neurological impulses are also interrupted. While it sounds like a shock from a stun gun takes a considerable amount of time to work, in truth everything happens in a matter of seconds. The strike can take someone down for up to a half hour. Now, if you’re interested in owning one of you own, you should take a look at our in-depth reviews on the best stun gun on the market. Sometimes, people refer to tasers as electroshock weapons or conducted electrical weapons. Like a stun gun, tasers will induce neuromuscular effects resulting in the temporary incapacitation of the targeted individual. A taser strike stimulates the motor and sensory nerves, causing muscles in the body to contract. One of the chief differences between tasers and stun guns is the latter induces a painful shock, while tasers, when the device is not put into the drive stun mode, are in no way dependent on pain compliance. Tasers are the preferred weapon of law enforcement over the use of other electronic weaponry, such as stun guns. Both tasers and stun guns are non-lethal, and when police rely on tasers, the incident of police officer injury drops more than 75 percent. The Bureau of Alcohol, Tobacco, and Firearms (BATF) does not identify tasers as a firearm. Tasers can reach up to 15 feet from the person shooting the weapon. The two probes are ejected when the user pulls the trigger. The probes are released from a replaceable, disposal cartridge. Tasers will cause an individual to be incapacitated for up to 30 seconds; thus, a difference between stun gun and taser weaponry is the amount of time an incapacitated state is induced. Taser devices are not considered lethal. A person with a pacemaker can withstand the energy emitted from a taser. Both stun guns and tasers can cause injury to the targeted individual, especially when the person loses balance, muscle control and falls after a strike. Even more, a taser can be easily done at home, with simple items you can easily find around. If you want to know more, take a look at our tutorial on how to make a taser. 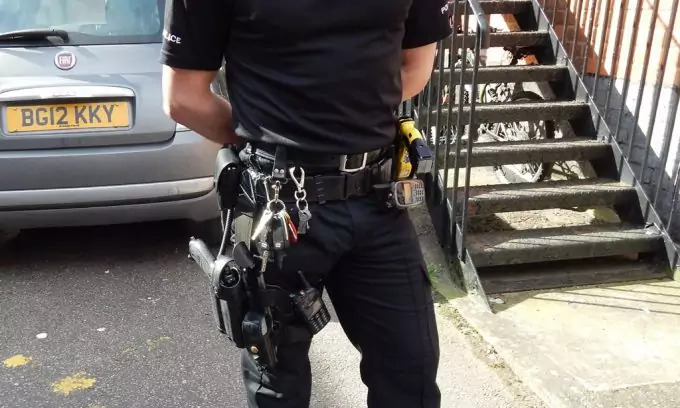 Police officers use one of two tasers: the Advanced Taser M26 or the Taser X26. The latter weaponry is limited to officers of the law only. 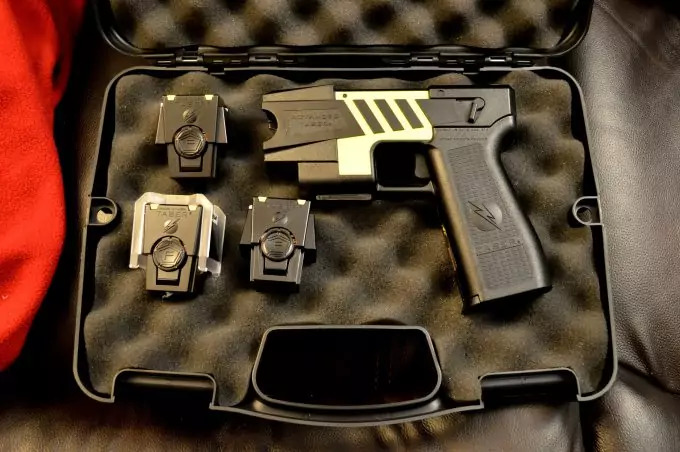 The police-preferred tasers have special features, wherein the devices are fitted with components so they can record vital information that can later be used in a court of law. Many models made for consumer use have the same striking and take down power, but consumer models are often smaller in terms of size. Tasers are similar to firearms in that the weapons have to be aimed and the user must pull a trigger to get the darts to escape from the cartridge. However, when firing a taser weapon, the device does not have a loud bang like a gun. Instead, there is a sound similar to the popping of a balloon. The weapon also does not recoil or kick back either. Cartridges are single use only and have to be replaced after each use. Inert and compressed nitrogen force the probes out of the cartridge when a user pulls the trigger on the device. The device delivers the probes at a speed of roughly 100 to 180 mph. Changing cartridges to reload a taser is easy. A reload action takes a mere second. While tasers have immediate incapacitating effects, such effects are not long lasting. Tasers are often preferred because there is no direct contact required for its use and it does not depend upon body penetration, pain, or impact to prove effective. Many people confuse stun guns with tasers and vice versa. A taser has a number of important differences when compared to contemporary stun gun weaponry. As mentioned earlier, one of the main differences between a taser and stun gun is the fact that a taser will release electrodes that look like tiny darts. The electrodes embed into the skin of the targeted individual. 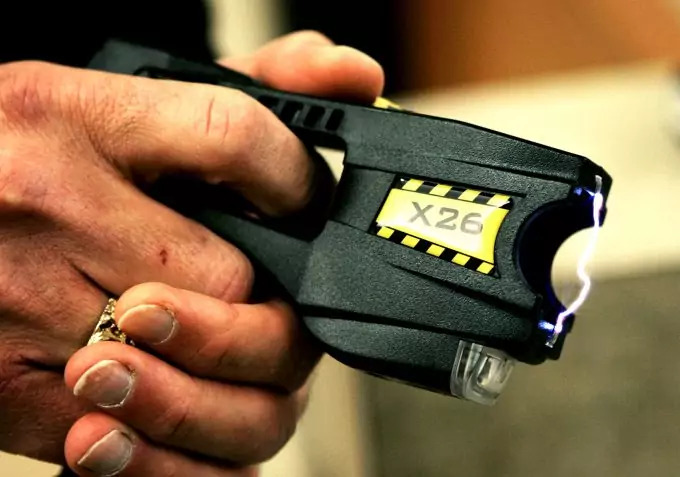 A difference between stun gun and taser weaponry is that a taser user will have to take aim and shoot the weapon in hopes of hitting the targeted individual. A stun gun user only has to make contact to make a strike. Both situations have cons. For instance, a taser user will have to have considerable skill; the user will have to take aim, fire, and hit the targeted attacker. In fact, having to do all the latter in a crisis requires a person to think and act quickly. There is the possibility that the taser user will miss the targeted individual entirely. Conversely, since the use of a stun gun requires close contact with an attacker, a stun gun user runs the risk of injury just prior to the use of the weapon. What’s more, because of the close proximity a stun gun user has to the attacker, it is possible that an attacker can get the stun gun out of the hands of the victim and, in turn, use the weapon on the victim. The latter factors need to be considered before purchasing either weapon. 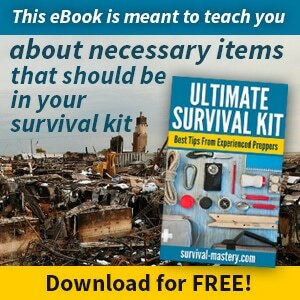 Of course, there are other tools you can use for self defense, besides stun guns or tasers. We have some great examples in this article with the best self defense products to have on you. Stun guns rely on high voltage to take down an attacker. Some of the guns have a voltage as high as one million volts or higher. However, the weapons also have low amperage so the strike remains non-lethal with no long-term effects. Baton stun guns: Are shaped like traditional batons. Thus, the weapons are not necessarily ideal for concealment. Nevertheless, carrying one in a vehicle or keeping one on hand at home can ensure a consumer has a weapon when one is needed. Cell Phone and flashlight guns: These devices are created to look like everyday items. There size and design make it easy to conceal the devices in a purse or handbag. Z-Force guns: Are devices that are small for the purposes of handheld operation and ease of concealment. Z-force stun guns range in voltage from 100,000 to 300,000 volts, and the weapons have an instant incapacitation rate that exceeds a 9mm gun. Stun master: These weapons have been on the market for a decade and half. This is the stun gun of choice for those seeking superior stopping power and affordable weaponry. A number of states have put restrictions on the purchase and use of stun guns. 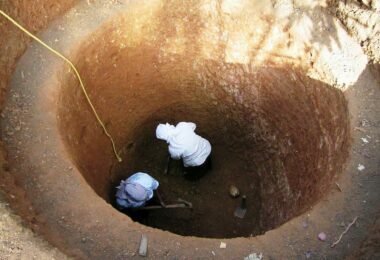 At present, nine states have banned the purchase and use of such weapons. The states banning sometimes make them entirely illegal and sometimes simply impose restrictions. In Connecticut, stun guns are legal, but there are still restrictions. In the District of Columbia, stun guns are entirely illegal to use. In the state of Illinois, a person must have a FOID card: the same card needed for firearm operation. The card must be valid. In Hawaii, Massachusetts, Michigan, New Jersey, New York, Rhode Island, Baltimore, Chicago, Howard County, MD, Philadelphia, and New York City, the weapons are entirely illegal. In Wisconsin, the weapons are restricted but legal. A person can transport the weapon if it is in a case, and a person can have on in their place of business or home. What’s more, several countries around the world have restrictions on stun gun purchases and use. At present, 13 countries prohibit stun guns. Restricting countries include the United Kingdom, Switzerland, Sweden, Norway, New Zealand, Japan, Italy, Hong Kong, Denmark, Canada, Belgium, and Australia. Only officers of the law can use stun guns in India. Taser.com/legal features a chart revealing the laws in relation to taser purchase and use in all 50 states in the nation. Even in states where tasers are legal for consumer use, certain age and use restrictions may apply. What’s more, some models may be legal in a state while others are not: it is the responsibility of the buyer to find out the laws within the jurisdiction where one resides. When it comes to federal parks throughout the nation, a consumer cannot carry or use a taser within the boundaries of any federal park. Legal for consumers to use Tasers are legal for consumers to use in all states except Hawaii, Massachusetts, New Jersey, New York, and Rhode Island. Legal for use, but restricted It is legal in the state of Connecticut to use a taser in the home. In the District of Columbia, the consumer needs to register the taser as a firearm. Legal for police usage Tasers are only prohibited in New Jersey for police use. The methods for finding out state and local laws pertaining to the usage of stun guns are myriad. Consumers can speak with an attorney familiar with the law or the local police. A phone call to a dealer of self-protection weaponry or a call to the Attorney General will also help a person discover the laws pertaining to taser use in a specific location. ZapLight Flashlight 1M stun gun: The Zaplight looks exactly like a mini flashlight, so concealing it is a breeze. The battery of the device is rechargeable, and even though this is a stun gun, it works like a real flashlight too. The device has six LED lights and a heavy-duty aluminum body. The stun gun is rechargeable, and reasonably priced with a tag around $60.00. 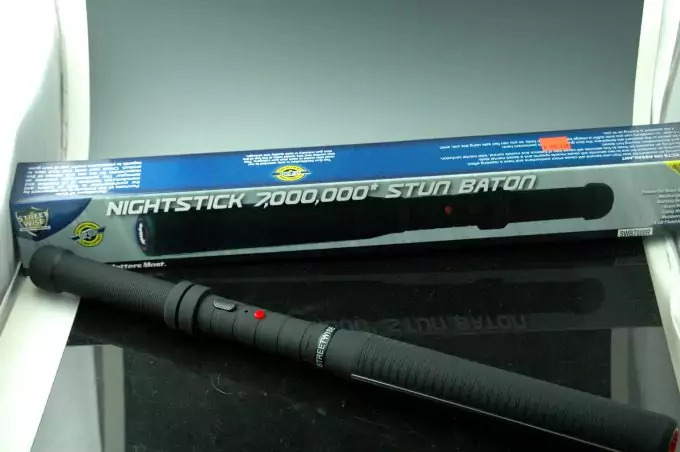 Lighting Rod rechargeable stun gun: This device packs a wallop with 2,500,000 volts. The device features a flashlight, lightning pen, and it comes with a holster for ease of transport. 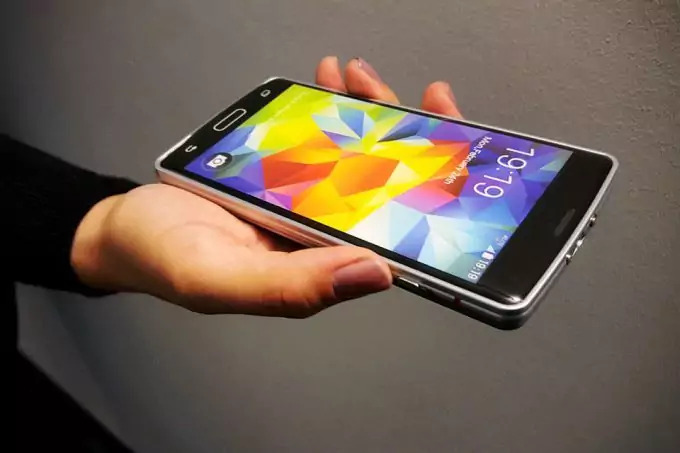 The device has a super low price tag of around $25.00. 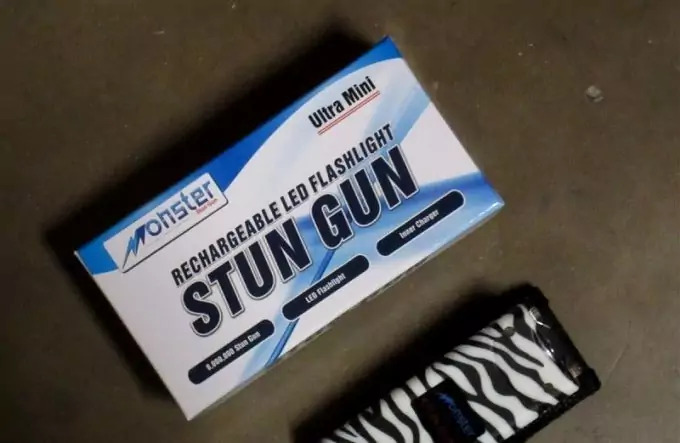 Zebra Monster stun gun 18M: This stun gun is not only fashionable with its zebra-striped exterior, its affordable with a price tag below $20.00. 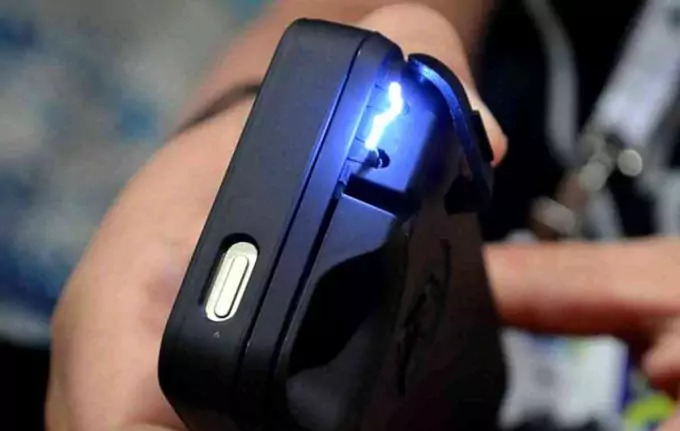 The device features a charging plug that slides out of the body of the stun gun, an LED flashlight, and it has 18M volts of power. Voltage: The higher the voltage a device has the better. Devices vary in voltage, but anything that packs a wallop of at least 800,000 volts is acceptable for protection. At the very least, when a person triggers the weapon, a cracking sound will accompany a flash of blue light; this in and of itself may frighten off an attacker, and if not, the device will still pack a serious wallop. Style: Devices come as small as a flashlight or cell phone, or they can be long like a 10 to 18-inch long baton stun weapon. Bear in mind, smaller weapons will require serious close contact with an assailant for the device to work. A baton still requires direct contact, but can put a bit of distance between the user and the target. Extras: A consumer should look at the extra features today’s stun guns come with: such features make the devices even more convenient. A device with extras gives the consumer more bang for their buck. Stun guns are made with working flashlights, alarms, and disabling pins that lend an additional level of safety. The latter feature allows a pin to pull out of the device if the attacker happens to get the device out of your hand. Tasers are pricier than stun guns. The weapons can range from a low-end price of $380.00 for a model like the Basic Taser® C2 to as high as $1560.00 for a Taser® X with a Dual Laser function. 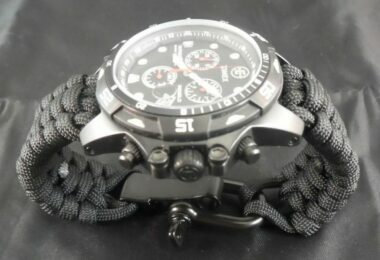 There are a number of affordable models on the market today, all of which are below $500.00. Consumers rate the Taser® M26C with a price tag of $118.00; the Taser® C2 Gold with Laser Red with a price tag of $400.00, and the Taser® M26C Advanced with Laser featuring a price tag of $499.99 among the most popular models on the market. When choosing a taser, the consumer needs to think about how the taser will be used; some models are ideal for non-lethal, carry and conceal protection, while others are better for people in the security field or for someone with firearm familiarity. Tasers differ in terms of design as well. Some are lightweight and small and others may be bulky or cumbersome. Additionally, tasers have different pulse times and the pulse timing can range from 10 to 30 seconds. Like stun guns, tasers come with plenty of extras. 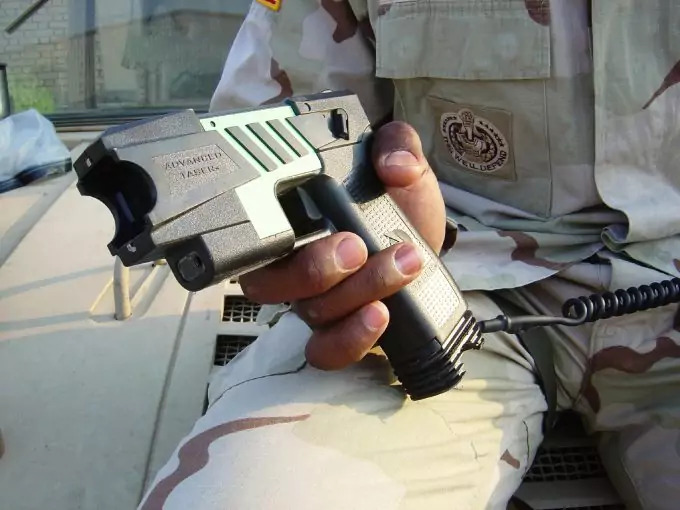 For instance, it is possible to get a taser with an LED flashlight, a laser site for greater aim and firing accuracy, and some are built with safety switches and power light indicators. Making the decision to buy a taser should be something that is done only after serious research is conducted pertaining to the type of models available and feature availability. After developing a solid understanding of the difference between stun gun and taser weaponry, a consumer will become more empowered when it comes time to choose the appropriate weapon for self-protection. Stun guns and tasers have pros and cons, but once informed about features, use, legalities, and models, the consumer will have the knowledge needed to choose the perfect weapon for personal protection. Stun guns and tasers are available online for purchase, and many weapon dealers offer detailed information about product features, specifications, and the law pertaining to ownership in all 50 states and the various countries around the world.